Over the weekend, from 9am Saturday until 9pm Saturday, I wrote 12 poems in 12 hours for the Poetry Half-Marathon. Today, I received my certificate of completion and couldn't be more happy! I can't wait to do it again next year. And if anyone is interested in what the Poetry Marathon is you can check out their website here. 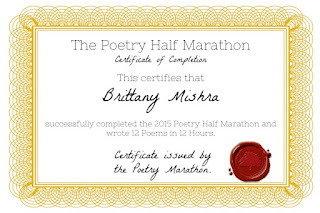 Below I posted one of the poems that I wrote during the marathon. You can check out the rest of my poems on my Wordpress profile here. The glare of your western face in the 6 am orb of sun. And your nose’s highest peak, tallest above all others. And shine more celestial than the brightest, rarest star.